What do we do if it’s not working? It’s a waste of money and resources to keep on providing a service and activities that aren’t working well or achieving positive outcomes for people. It’s a waste of money and resources to keep on providing a service and activities that aren’t working well or achieving positive outcomes for people. This is why it’s important to evaluate your service as you go and keep an eye on what the information you collect is telling you. Making informed changes can help you have a bigger impact. Remember small changes can make the biggest difference. Before you do anything, make sure there really is a problem from your participants’ perspective and that it’s not just that things aren’t going quite the way you expected. Are you achieving some different (unexpected) outcomes instead of the ones you anticipated? Did you set overambitious targets or timelines? It may take much longer than you expect to engage people and become established. If there is a problem, find out why things aren’t working. Don’t delay, but revisit your planning stage and consult with people again before deciding what to do. Don’t be scared to make changes as long as you have good reason to. Find out from your funder what you can change. If the programme isn’t working, most funders would far rather you made adjustments than ploughed on regardless, as long as you check with them first. The Active Lives project used physical activity to improve the health and wellbeing of inactive adults, over 45 years, living in communities affected by poverty. Participants were able to refer themselves to the project or could be referred by health professionals or organisations working in areas of deprivation. The programme offered support for a period of 2 years, enabling participants to try different types of physical activity and encouraging them to remain active by supporting long term behavioural changes. 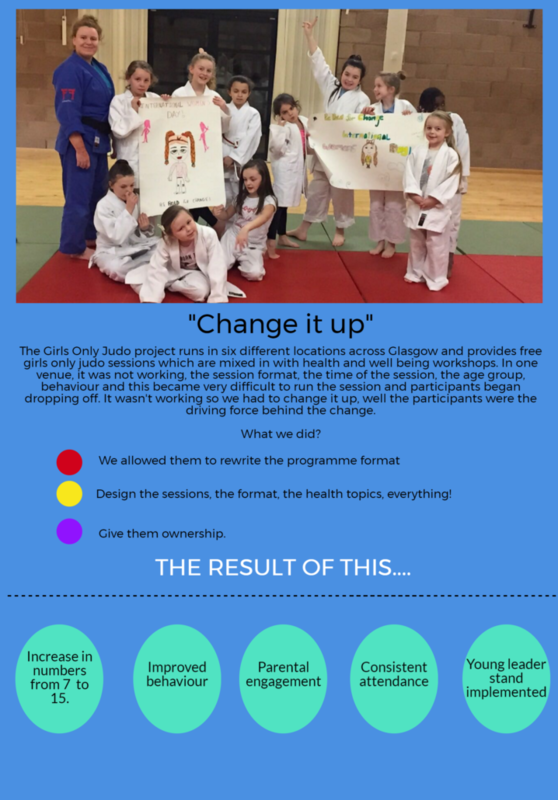 The project ran from 2012 – 2017, and following a very community focused introduction the programme took on a city-wide remit and became very process driven with a large focus on reporting the volume of referrals we were generating and the activity levels of participants. We realised that this focus was taking us away from the individual and we did not have up to date knowledge of the participant’s needs, wants and motivations, which was making it challenging to ensure we were offering the right activities. What we did was adapt our delivery approach to allow us to spend more time with participants and focus on providing a person centred approach. With a city-wide remit, a focus on generating referrals and delivery team of 2 project officers due to resources we would send new participants a welcome pack which included their leisure card and the offer of a 1-1 with a project officer which the individual was required to opt into. We recognised that this was not a person centred approach and that often the people not opting in were the ones who would have benefited most from face to face individualised support. What adapted the way we welcomed new participants into Active Lives meaning each new participant would receive a phone call from a member of the project team to arrange a 1 to 1 meeting where, through motivational interviewing, we would gain an understanding of their needs, wants and motivations and be able to provide the right level of support to empower them to become active. They were also given their leisure card and asked to complete a baseline questionnaire. Not only was this a more person centred approach it increased the number of baseline questionnaires that we received allowing us to build a more robust evidence base. How do we know if the sessions are working well? How do we know what works, what doesn’t and why?